ABBOTT PARK, Ill., Jan. 2, 2018 /PRNewswire/ -- Abbott (NYSE: ABT) today announced CE Mark for its Alinity h-series integrated system for hematology testing, joining the Alinity hq standalone hematology analyzer, which obtained CE Mark earlier this year. To learn more about the Alinity h-series system, visit corelaboratory.abbott/hematology. 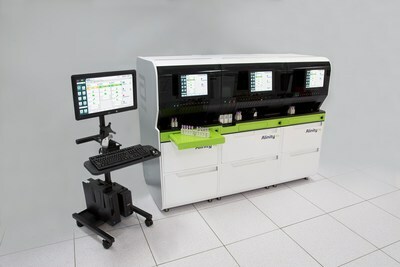 The Alinity portfolio includes clinical chemistry, immunoassay, blood and plasma screening, point of care, hematology and molecular diagnostics, along with Abbott's AlinIQ—a first-of-its-kind, holistic suite of professional services that combines expertise with process analysis and informatics. Alinity is helping labs and hospital systems solve some of their most pressing challenges to deliver better patient care. More information is available at http://www.abbott.com/alinity.